Cristina’s Mexican Restaurant was established in 1989 and has been growing carefully in order to preserve its original home style cooking and hospitable touch. 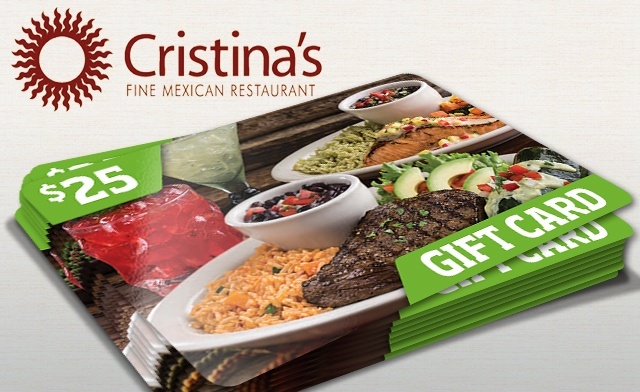 Cristina’s offers a combination of the best Comida Tex-Mex and a selection of favorite authentic and traditional dishes from the Vargas family’s hometown of Cuernavaca. The Vargas family has roots from central Mexico along with down home Texas ties. It is that combination that has helped create Cristina’s unique menu of down home Tex-Mex favorites and unique central Mexican dishes. The restaurant is perfect for those who like to complement a delicious meal with a carefully crafted margarita or a Mexican beer. Just $18 buys you $25 worth of delicious cuisine! Central Mexican cuisine and Tex-Mex favorites, all authentically prepared. Enjoy the "comida casera" (home cooking) and family style service. Gift Cards will be mailed within 5 business days via USPS. Good at all DFW locations.